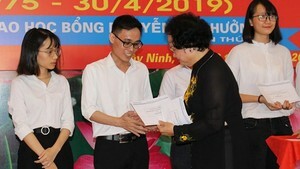 The Japanese government will provide US$95,500 to build a primary school in the northern province of Bac Giang’s Hiep Hoa district, it was announced at the Japanese Embassy in Hanoi on July 27. As part of the Grassroots and Human Security Project, Japanese Ambassador Mitsuo Sakaba handed over the money to Nguyen Van Quy and chairman of the Danh Thang commune in district Hiep Hoa on July 27. The primary school built in 1978 is in bad repair without enough classrooms to accommodate all the commune’s children; therefore, classes are divided into three shifts. The project aims to improve the learning environment for children in Danh Thang and reduce the dropout rate. Under the project, eight classrooms will be built to replace old ones. Ambassador Sakaba said at the meeting that he hopes teaching, learning and the overall quality of the school would improve and that the friendship and mutual understanding between Japan and Vietnam will further deepen through these projects.